UK GDP contracted faster than previously announced in the first quarter of 2012. What would the evolution of GDP have looked like during this crisis if the UK had been part of the Euro area? Impossible to tell as we cannot do a proper counterfactual exercise. 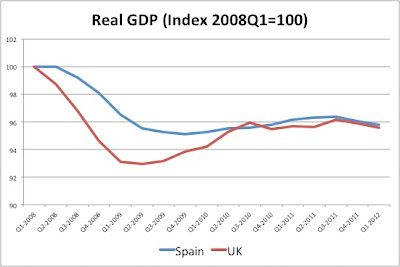 But here is a potentially interesting comparison: the evolution of the UK and Spanish economies since the beginning of the crisis. Spain and the UK are both large (by European standards) economies. Both of them started the crisis with current account deficits and suffered a real estate bubble prior to the crisis. There are, of course, differences: the UK financial sector is larger than that of Spain; the real estate bubble was larger in Spain,... But the difference that tends to be highlighted more by economic commentary is the Euro membership. Spain could not depreciate its currency as the UK did, Spain cannot resolve its government debt problems by relying on its central bank, and Spain could not lower the interest rate to zero as the UK did. Are these factors visible in the evolution of GDP from the beginning of the crisis to today? Not obvious. If we take the end of 2007 as the beginning of the crisis, real GDP is today at the same relative level in both economies. The UK suffered more in the first quarters and then recovered. The Spanish economy was doing better earlier and then fell faster. Since the second quarter of 2010 both economies have been moving in parallel. This is clearly not a scientific proof that Euro membership has not made a large difference (I am not controlling for all the other factors). But at a minimum, it raises questions about the statement that membership in the Euro area is a key factor to understand the performance of Euro members during the crisis. 1. Prior to the crisis, inflation was higher in Southern Europe. 2. These countries displayed large current account deficits, a sign of an overvalued real exchange rate. I have presented arguments before that support Wolfgang Munchau's conclusions. Let me repeat some of the arguments and show additional evidence. Unit labor costs grew faster in Spain or Greece or Italy than in Germany. But Germany was the outlier here. 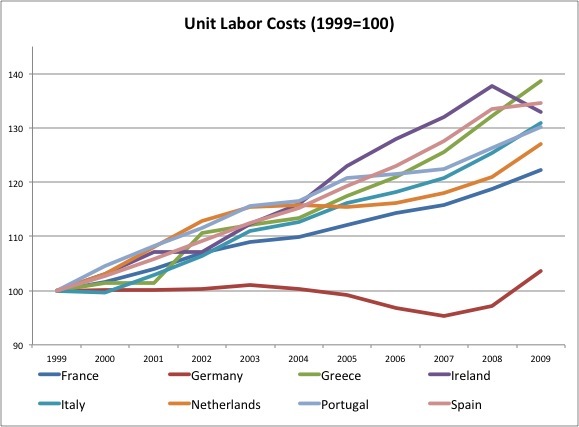 The behavior of unit labor costs in some of the countries in Southern Europe was not too different from that of France or the Netherlands. Here is a chart from an earlier post. It is correct that Greece, Spain and Ireland saw higher increases in unit labor costs during the 10 years of the Euro. But the difference is small compared to France or the Netherlands. For example, comparing Spain and the Netherlands the difference is about 5 percentage points over a decade. This is not a large number given how volatile exchange rates are. Estimates of unit labor costs are very imprecise and maybe they are not capturing the true loss in competitiveness of these economies. So why don't we look at the outcome? What about the current account balance? Countries like Spain or Greece run large current account deficits during these years. Isn't this a proof that they had lost competitiveness? Possibly, but there are other potential explanations for a current account deficit, such as an increase in spending fueled by a real estate bubble. It is not clear how to tell the two stories apart but here is a piece of evidence that I find useful. 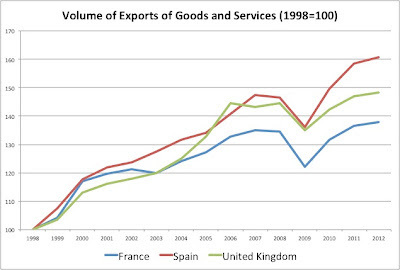 What happened to exports in Spain during all these years? If the story of lack of competitiveness is true one might expect that exports did not behave well during this decade as unit labor costs grew too fast. But the data reveals the opposite pattern. 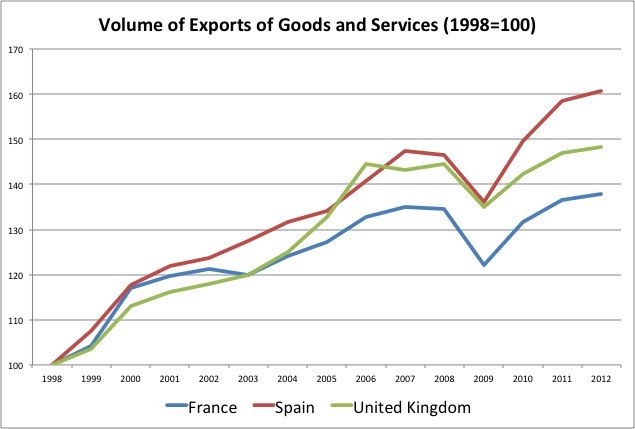 Compared to France or the UK (just to pick an outsider), Spanish exports grew faster during the last 10 years. Does it mean that competitiveness is not a problem? No, but it might be a small factor compared to many other factors that have led these economies to the crisis. And if this is true, focusing on internal (or external, via exit from the Euro) devaluation as the solution to the crisis might distract us from dealing with the real issues. Since the launch of the Euro, there has always been a question about the benefits that Germany could enjoy of sharing a currency with other countries. While for the other countries (the "periphery") the benefits in terms of credibility and stability of a strong currency were obvious, for Germany the benefits were simply the additional trade integration that the Euro would produce. Some believed that this benefit was too small to compensate for the potential risk of being part of a club with riskier countries. The current crisis has provided arguments for those who believed that Germany should have never been part of the Euro. There is, however, a different perspective of the first 12 years of the Euro when looking at the performance of the German economy. During those years Germany managed to engineer a reduction to its relative labor costs that paid off in terms of increasing exports, a large surplus in the current account and faster GDP growth. A model that some see today as an example for others to follow. As Paul Krugman has pointed out several times, this model cannot work for everyone, not all countries can run current account surpluses! In his most recent article Paul Krugman argues that the current German model needed the Euro to work. Germany had tried to keep labor costs under control in the past but without success. The launch of the Euro locked the exchange rate and sent capital flows to the periphery producing inflation in those countries. Even if German inflation was still positive (so no painful disinflation), there was an inflation gap with others, one that allowed Germany to be more competitive as the periphery became less competitive. "Or to put it differently: Germany believes that its successful adjustment was the result of its own virtue, but in reality it was successful in large part because of an inflationary boom in the rest of Europe. And here’s the thing: the Germans are now demanding that the European periphery replicate its achievement (and actually surpass it, because the required adjustment is much bigger) without providing a comparably favorable environment — they’re demanding that Spain and others do what they never did, which is deflate their way to competitiveness." The corollary of this argument is that Germany benefited from the Euro in a way that was not expected at the time when it was launched: by allowing an increase in competitiveness relative to the other Euro members. I agree with this argument but I think that there is part of the story that is missing. Not all other members of the Euro area had high inflation. Let's compare Germany to France. Since the launch of the Euro unit labor costs in France increased faster than in Germany. By the way, France resembles many of the other "periphery" countries in terms of unit labor costs, as I have discussed earlier. Here is the early chart. But France did not lose competitiveness through higher inflation. 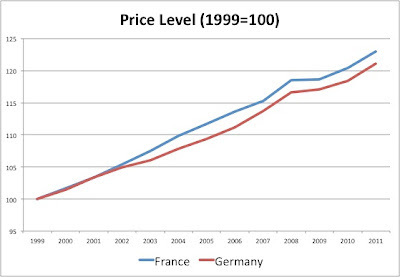 Prices in France and Germany behaved in a similar way, there was no inflation gap. 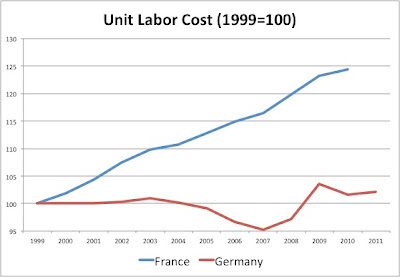 So in the comparison between France and Germany the story above does not seem to work, adjustment did not come from inflation in other countries but by the relative control of wages in Germany (relative, of course, to changes in labor productivity and all of this relative to French wages). But here is where I the Euro could still have played a role: when Germany had its own currency, it was very difficult to engineer a "competitive devaluation". Reductions in wages or prices could easily be compensated by a stronger currency (the German Mark). This might run contrary to our intuition that competitive devaluations are easier with flexible exchange rates. For a country very committed to keep inflation low and a strong currency, it is difficult to deliver a competitive devaluation through monetary policy. But once the exchange rate is fixed, a combination of control on labor costs and the inflation that was generated in some of the periphery countries finally allowed Germany to produce a reduction in unit labor costs and growth via expansion of exports. And that is how Germany benefited from the Euro.